There was a time in my life that things weren’t going great and during that time I wanted to get back to my roots. I wanted to be around some of those folks that were the foundation of my life. Friday night at the Yum Center the Louisville program started a new journey and there was a lot of old school walking around that building. This program is going back to its roots and it felt good to see some of the old players and coaches there in support of David Padgett and this team. This program is going thru some difficult times but the foundation is just as strong as it ever was. And its because of that foundation that I’m confident that everything is going to be fine and this is going to be a fun season. You couldn’t tell that there had been any turmoil over the last couple of weeks in the post-game locker room tonight. Those young men were enthusiastic, happy and seemed very confident in their mission this season. All of them seemed very excited to be back in front of the fans and playing the game that they love. Friday Night was the first time that I had seen the freshman class live since the Derby Festival Basketball game. I was really impressed with Jordan Nwora that night and felt the same tonight. He was the fourth leading scorer with 18 points and 4 of 6 from the three. He is a kid that can drive and bang in the lane and can pull up from deep. He has all the weapons supported by a massive frame. Will be fun watching him for 4 years. Out of this freshman group I thought that Lance Thomas had the most work to do. He was the second highest in scoring in this group with 8 points. This kid has put in the time in the weight room and has added some bulk. He is another player that can score from all over the court. He is going to be a good one. Darius Perry and Malik Williams had quiet nights offensively but Perry led in assist with 9 and Williams was the leading re-bounder with 17. And both are going to be incredible scorers. This freshman group if they stay together will end up being our bridge over troubled water. We can ride out a few rough years with guys like these. I have always been a Ryan McMahon fan. He has a beautiful three point shot and is a better basketball player than some give him credit. He got off to a solid start tonight going 2-2 from the three and scoring 6 points before he got hurt and had to exit the game. He had a behind the back assist in a break away play with Adel that brought the house down. His court vision is next level. Deng Adel was the leading scorer for the game with 32 points, 13 rebounds, 4 assists and 2 steals. And what can’t he do? He is a future NBA player and has got all the skills. This team will win a lot of basketball games just because he is on it. Another guy that was doing it all on Friday night was Ray Spalding. He was the third leading scored with 22 points, 16 rebounds, 1 assist and 6 steals… He is by far the most improved player on the team and showed that in this scrimmage. Ray being one of the hometown kids makes it even better. Speaking of hometown kids Quentin Snider is headed into his last season as a Cardinal. He had 12 points, 5 assists and 2 steals. He is one of the most consistent players that I’ve ever watched in my lifetime. He quietly leads this group on the court and his calm demeanor never changes. Not even in the big moments. Those big tourney games and that performance against UK last season. I’ve enjoyed them all. I feel a lot better knowing a guy like Quentin Snider is around. No matter what happens you know he’s going to show up to play basketball. 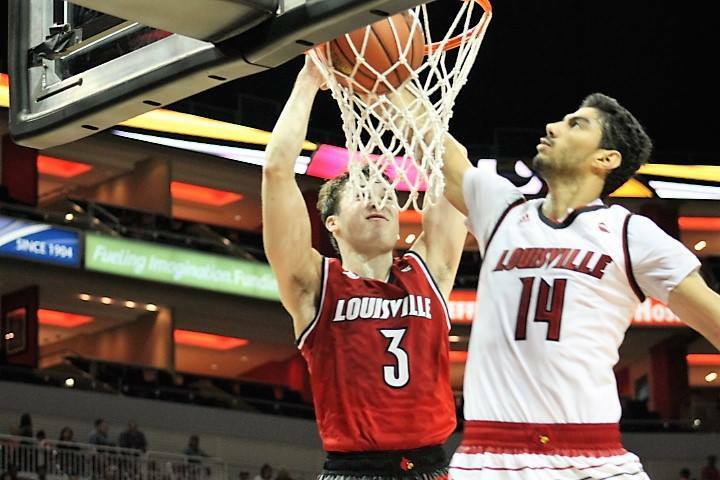 Another guy that I’m glad to have in the locker-room is Anas Mahmoud. He’s going to get dunked on, and he’s not going to be the best player on the court but that guy brings a lot of heart to the table. His positive attitude is contagious. The more positive we can have right now the better. Freshman Walk on Jo Griffen added his name to the long list to dunk on Anas. Griffen is going to be another great walk-on to add to the Cardinals great legacy. This kid can play and has that sneaky athleticism. He will dunk on you. Just ask Anas. Folks better not sleep on this group of Cardinals. They are long, athletic, and they can shoot the ball very well. This might be one of the better offensive teams that the program has ever had. I think they will have to overcome some obstacles but so far, they seem like they haven’t missed a beat. I contribute that to the leadership provided by David Padgett. He was a floor general back in 2008 when he played for the Cardinals and now he’s running this team with that same passion, dedication and pride. After watching the first Red & White Scrimmage I feel much better about things. This entry was posted in BEAK NEWS by ru4uofl. Bookmark the permalink.